Transparency Market Research (TMR) has published a new report titled, “Hypopigmentation Disorder Treatment Market - Global Industry Analysis, Size, Share, Growth, Trends, and Forecast, 2018–2026.” According to the report, the global hypopigmentation disorder treatment market was valued at US$ 1,277.7 Mn in 2017 and is projected to expand at a high CAGR of 5.9% from 2018 to 2026. Rise in prevalence of hypopigmentation disorders across the world is anticipated to drive the global hypopigmentation disorder treatment market during the forecast period. Asia Pacific and North America are projected to dominate the global hypopigmentation disorder treatment market during the forecast period. The market in these regions is primarily driven by increase in government initiatives and awareness about vitiligo and other hypopigmentation disorders. The market in Asia Pacific is anticipated to expand at a high CAGR from 2018 to 2026. The hypopigmentation disorder treatment market in North America is expected to expand at a moderate CAGR during the forecast period. The hypopigmentation disorder treatment market in Latin America is likely to grow at a moderate pace from 2018 to 2026. In terms of treatment, the topical drugs segment is projected to account for dominant share of the global hypopigmentation disorder treatment market during the forecast period. The segment is anticipated to expand at a high CAGR from 2018 to 2026. Dominance of the segment is attributed to increase in patient preference for topical drugs as the first line of treatment due to lower cost and higher efficacy. The chemical peels segment held major share of the market in 2017, followed by the topical drugs segment, due to increase in acceptance and popularity of chemical peels by dermatologists as well as patients. The laser therapy and microdermabrasion segments accounted for around 10.0% share of the global hypopigmentation disorder treatment market in terms of revenue in 2017. The report offers detailed segmentation of the global hypopigmentation disorder treatment market based on treatment, disease indication, and end-user. In terms of disease indication, the market has been classified into vitiligo, albinism, and others. The vitiligo segment is projected to account for leading share of the global market during the forecast period. Higher share of the segment is attributed to rise in the number of patients undergoing treatment for vitiligo. According to the Global Vitiligo Foundation, currently 70 million people across the world and about 2.7 million people in the U.S. have vitiligo. Based on end-user, the aesthetic clinics & dermatology centers segment accounted for a leading share of the global hypopigmentation disorder treatment market in 2017. The segment is projected to gain market share from 2018 to 2026. The segment is anticipated to expand at a high CAGR during the forecast period due to the well-developed aesthetic clinic & dermatology center infrastructure, increase in adoption of new devices and techniques by aesthetic clinics & dermatology centers, and quality of expertise available in clinics. Hospitals was a prominent segment of the global market in 2017, followed by the aesthetic clinics & dermatology centers segment. This is due to increase in the number of multi-specialty hospitals in developing countries. 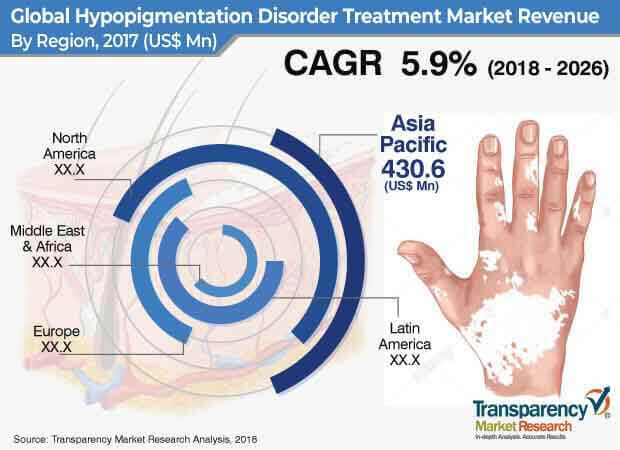 The hypopigmentation disorder treatment market in Asia Pacific is driven by rise in medical tourism in countries such as India and China, increase in geriatric population, surge in health care spending, and government initiatives. High population, unmet medical needs, and rise in patient awareness are also anticipated to propel the market in the region. Economic growth in emerging economies such as India and China is enhancing the buying capabilities of consumers due to an increase in disposable income. This is likely to boost the market in the country in the near future. The global hypopigmentation disorder treatment market is fragmented, owing to the presence of several small and large companies. However, the market is dominated by a few major players with strong global presence. The report provides profiles of leading players operating in the global hypopigmentation disorder treatment market. Key players in the market include Allergan, SkinCeuticals, Pierre Fabre, Episciences, Inc., RXi Pharmaceuticals Corporation, Obagi Cosmeceuticals LLC (Obagi Medical), and Alvogen.